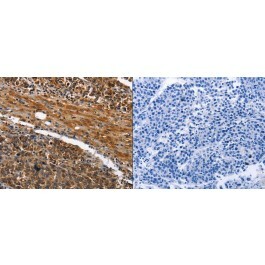 Search for all "DPYSL2 / CRMP2"
Rabbit anti Human, Mouse, Rat DPYSL2 / CRMP2. Synthetic peptide corresponding to a region derived from 476-493 amino acids of Human dihydropyrimidinase-like 2. This gene encodes a member of the collapsin response mediator protein family. Collapsin response mediator proteins form homo- and hetero-tetramers and facilitate neuron guidance; growth and polarity. The encoded protein promotes microtubule assembly and is required for Sema3A-mediated growth cone collapse; and also plays a role in syptic sigling through interactions with calcium channels. This gene has been implicated in multiple neurological disorders; and hyperphosphorylation of the encoded protein may play a key role in the development of Alzheimer's disease. Altertively spliced transcript variants encoding multiple isoforms have been observed for this gene.